Band and choir are music to our ears! We believe music is a lifelong journey! 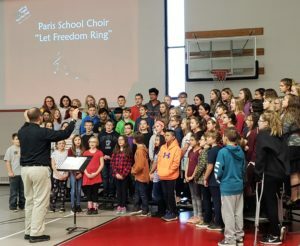 With our Army Band-experienced teacher at the helm, Paris School students make social, emotional, technical, and intellectual connections that only music performance can provide. General music class for our K-4 graders follows a piano curriculum that teaches basic note reading and progresses to playing three note songs, note reading sequenced from letter-name reading, to progressive rhythm reading. Students in grades 5-8 may choose either choir or general music and also have the option to learn a musical instrument through weekly full- and small-group band lessons. Our “sight before sound” approach teaches students to recognize musical concepts and master rhythm. Once rhythm is mastered, students learn what the notation for that rhythm looks like. For this reason, much of music class involves singing, moving, and listening to music that students will later learn to read.